For those of us who love wine, there is nothing such a joy to use as an excellent wine bottle opener. We waited to add such an item to our inventory until we found the perfect balance between beauty and utility. 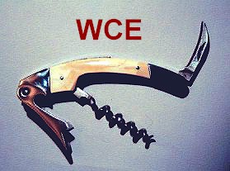 Our proven "Waiter's Friend" type corkscrew is the perfect wineopener! Its stainless steel body is gently curved to just fit into your palm while piercing the cork and easily turning the cleverly designed 4-turn corkscrew. The sharp stainless steel folding blade makes quick work of even the toughest of foils. It even has an integral bottle cap opener. Its Fossil Ivory handle will make you proud every time you offer wine at your table. Add a smart red or black liner between the Fossil Ivory and the body of the extractor as an additional option. Personalize the Fossil Ivory Cork Extractor handle with your name or initials and one of our scrimshaw designs at no extra cost! If it's for on board your boat, we'll even add an etching of your own boat at a small extra charge! 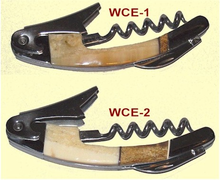 In addition to our popular Wine Cork Extractor - WCE (One piece of light Fossil Ivory), we now offer the option of two new styles - WCE-1 (A light piece of Fossil Ivory offset by a small piece of dark ivory) and WCE-2 (A light piece of Fossil Ivory set with a larger piece of dark ivory). All are shown above, and all are available with scrimshaw. This superb tool is 4 1/4 inches long. Our Wine Bottle Opener makes a gift that will delight any wine lover!